You may also want to look into some type of flag for the notifications. Otherwise they will continuously be sent while it detects motion (unless that is what you want). understood, hence the arm/disarm button in the app. But when it is armed, and it detects motion, you will continuously receive notifications until the pir resets itself. It is not about them being safe. It is about there state, either HIGH/LOW. Sounds like your home is now safe. Just FYI … the ESP8266 has built-in pull-up resistors. You should reliably read HIGH in the absence of motion. dous this have to be pullup? You can use that to be safe, but I believe the internal pull-up resisters are enabled by default with the ESP8266. You should be good to go with the last sketch @Toro_Blanco gave you. As he pointed out, just address the issue with the notifications being sent once a second while motion is detected. Thnk you @WIckedbeernut and @Toro_Blanco for pointing me in the right direction i have a go at it tonight and tomorrow and i will report back here… THANKS for your help! 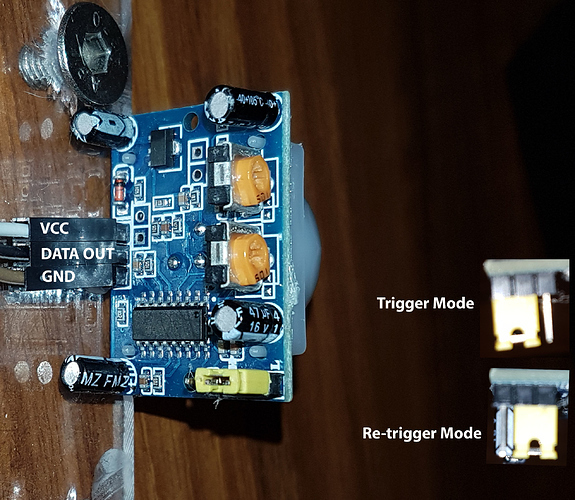 I Adjusted the code to work with only one pir sensor because i did not have a power suply that can deliver 3x 5V… thats why i just added one pirsensor. And again Thnk you @WIckedbeernut and @Toro_Blanco for your help! Be careful, this most likely means it is outputting 5V as well. ESP GPIOs are only rated for 3.3V (although there is some debate about this). I tend to err on the side of caution, and try to stick with 3.3V max on GPIO pins. I guess that means you can disregard my previous comment. The question is whether your power supply can deliver 3 x 65 mA = 195 mA at 5 VDC (plus the current of your NodeMCU and LED). What power supply are you using?